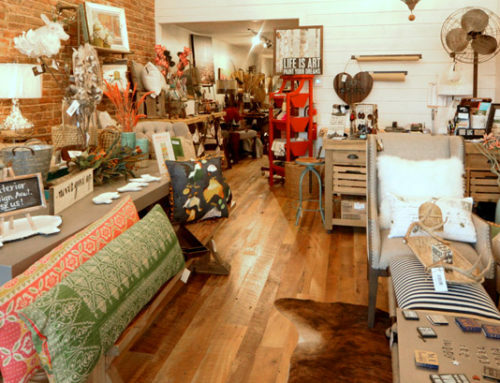 Reclaiming Barn Wood Requires Precision and Care! 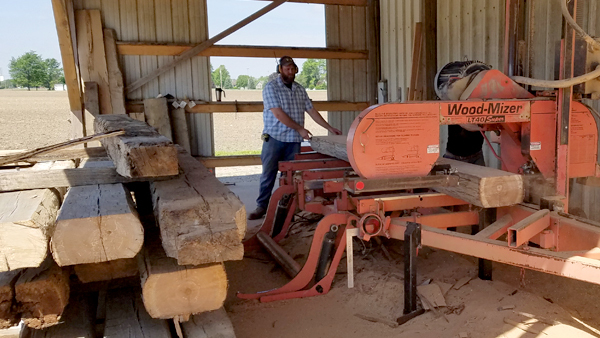 This is the second in a series of features which follows reclaimed wood from the abandoned barn it came from, through our mill shop, to the finished product installed in a new home. View the first feature here. 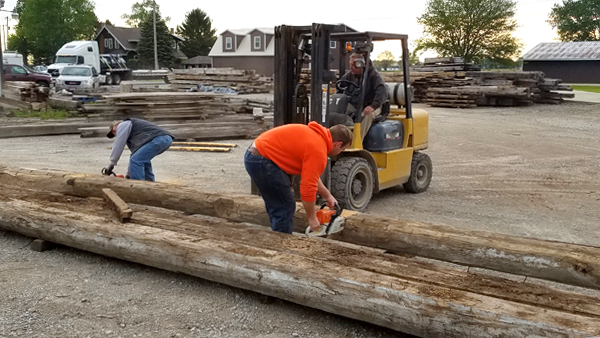 Once the barn and home in Bradford, Ohio were completely dismantled (piece-by-piece to maximize the amount of timber being reclaimed), it was loaded up and brought to our millshop in Covington, Ohio. 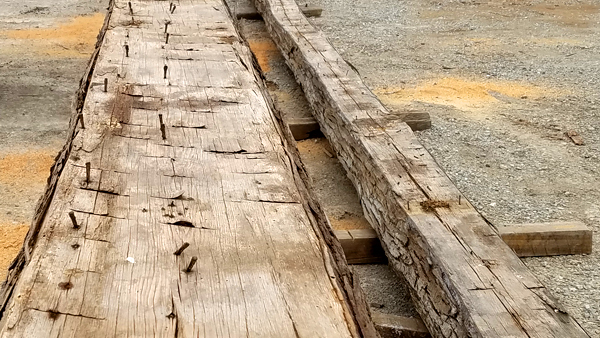 The upper frame, hand-hewn beams were sold as decorative timber and the sleepers (the two sided hand-hewn beams under the floor of the barn) are made into flooring. 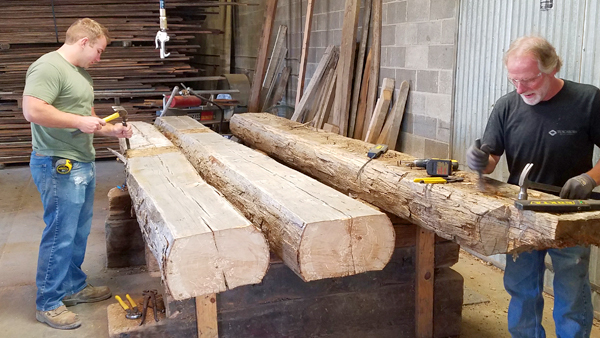 These hickory beams will go through a precise, multi-step process before they’re ready to be installed as new hardwood flooring. Much of the time and work done in reclaiming this wood is prepping it for the final milling process. Once these massive beams are unloaded from the trailer they are cut to length. Then starts, what can sometimes be a long, arduous task – the complete de-nailing of the the entire beam – all by hand. This is an incredibly important step in the process as nails left in the beam can wreak havoc as we move along in the milling process. 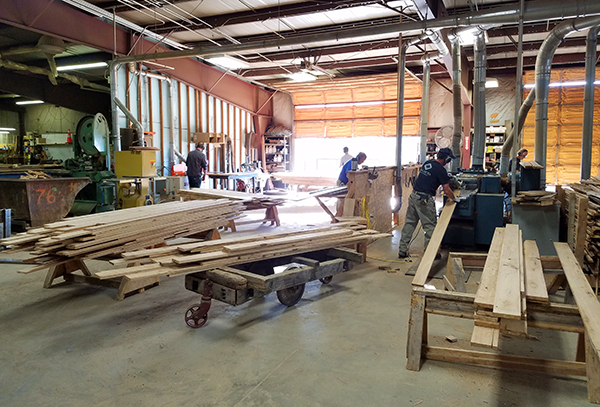 Once the beam is completely de-nailed, it’s time this lumber begins to take shape. The beam is cut into boards (some up to 16″ wide!) with the thickness determined by the final product. 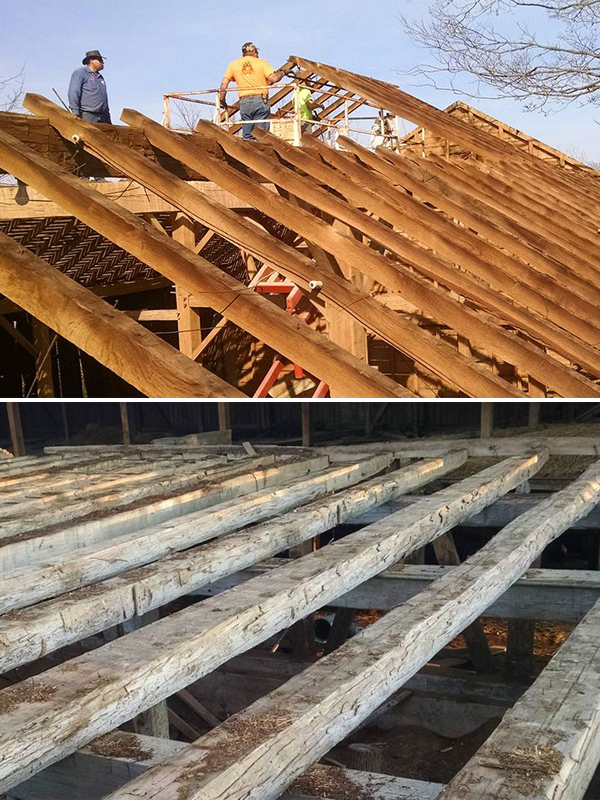 After the beams are cut, the boards are then kiln dried for 5-6 days with a high-heat kiln that reaches 150 degrees. 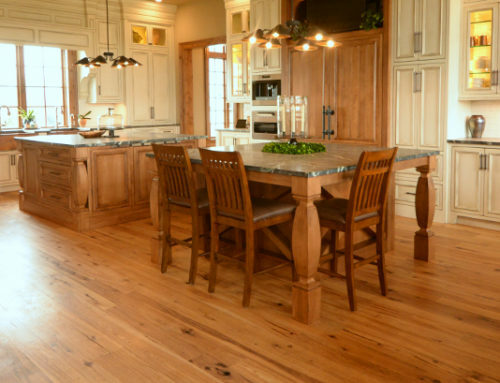 This process not only brings the moisture down to 6-8 percent as needed for flooring, but also kills any bug life that might be in the wood. 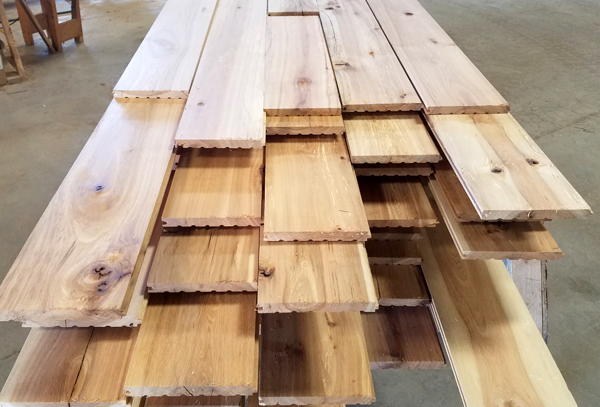 The rough-cut boards are kiln dried to bring the moisture down to 6-8 percent as needed for flooring and kill any bug life that might be in the wood. 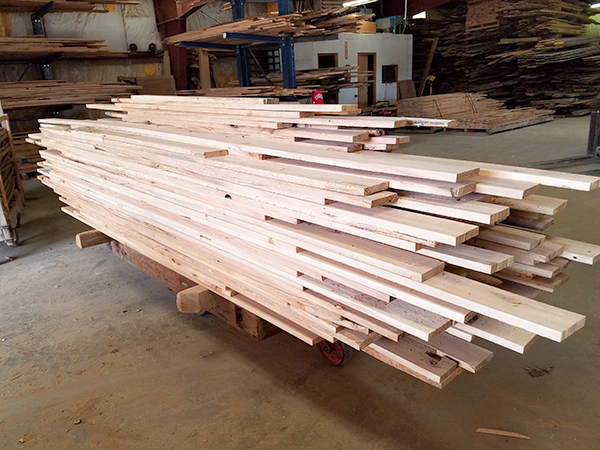 After the boards are kiln dried, the lumber is ready for the final steps in the milling process. 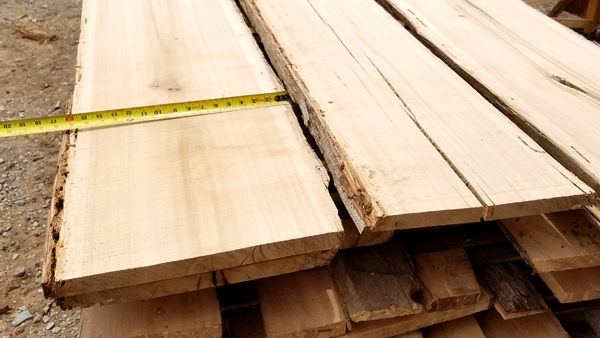 Each board is planed to exact thickness and straight lined into a smooth blank. Now, with a clean board to work with, the boards are finally milled into tongue-and-groove flooring. 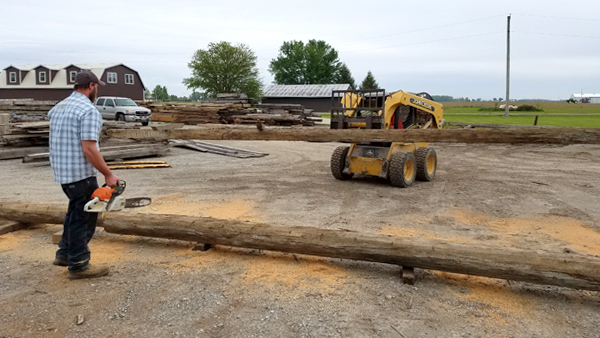 These hickory beams from the barn in Bradford will be milled into nearly 5,500 square-feet of hardwood flooring for a new home in Troy, Ohio. 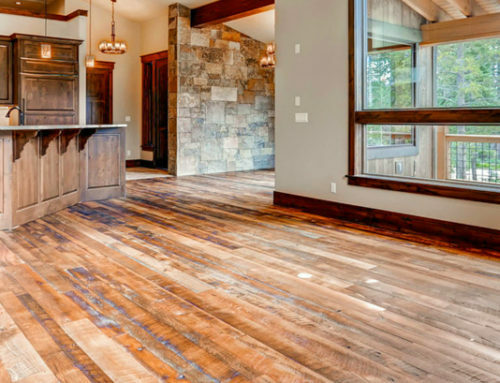 In our last installment of this feature, we will show the final product, completely reclaimed and finished as beautiful hardwood flooring. Stay tuned! 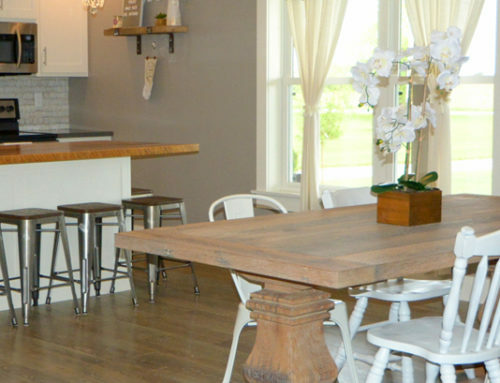 Love our floors that your manufactured for our lake home in Michigan. And we appreciated all the helpful suggestions for our installer! Interesting to see the whole process here. 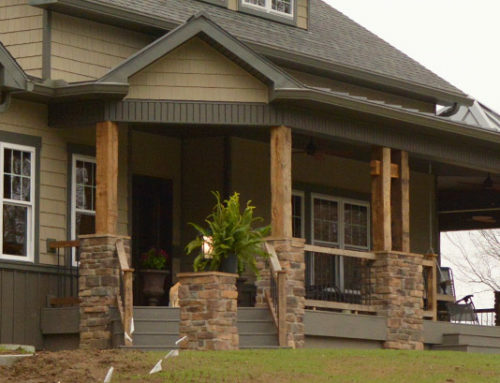 Thanks for the feedback Clyde, we love to hear from satisfied customers! I love how you are showing this start to finish job. So interesting! Thank you for sharing! Glad to hear you like this Roxanne, thanks!